Smart added another denomination to their list of Unlisurf Promo where you can enjoy 7 days unlimited internet for only 250 pesos. As seen on their new TV commercial starred by Anne Curtis, Rico Blanco and Kobe Paras, you can now connect to the web anywhere from Smart Bro's fastest network with over 10,000 LTE & HSPA+ sites all over the Philippines. Forget those unthinkable moments as tomorrow's internet is here, live streaming, music and video downloading, social fun and news updates all can be possible anytime and anywhere you want. Get ready and register to UNLISURF 250 by just texting the promo code provided below. 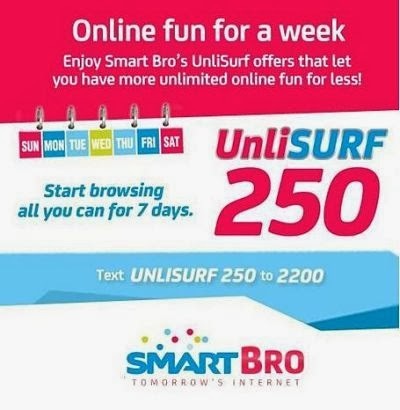 If you're looking to avail internet surfing for the whole week using your mobile or broadband, you can subscribe to UNLISURF250 promo from Smart. Instead of daily subscription, you can only register once and your good to browse without limits until 7 days. You can save an amount of 45 on this promo, well show you the comparison below. See, it's cheaper and hassle free internet browsing. Use your Smart Bro sim to register and enjoy browsing on your laptop, tablet, smartphone using any browser. If you want more cheaper internet for 7 days you can avail UNLISURF 80 but take note that you can only use Opera Mini for (Android, Java, iPhone IOS) browser. If LTE is available on your area, you can try prepaid LTE UNLISURF Promo. If you're having slow internet connection problem on your current provider, feel free to try this Smart Bro promo. No need for you look for any tricks or try any hack just to connect to the internet, it only needs a load to enjoy the true fast internet connection. Make sure that your area has 3G or higher signal. Check it online or you can do it using your phone or USB broadband stick dashboard. Make sure you have strong network signal. One bar 3G/HSPA+ signal is unstable. Do a manual selection and force to connect on 3G network if available then observed your internet speed. If unstable, you can select auto mode or dual mode preference. Update as of January 2016: Smart now offers 1 week surfing by registering to SURFMAX250 (7 days internet browsing). Check out the promo on how to subscribe.